I tested the new version PDK 1.0.1.0 on SmartCloud Application Workload Service which run IWD 3.1.0.5. Normally, the PDK 1.0.1.0 is compatible with IWD 3.1.0.6 but I didn’t face any issue while using it. First you can connect your SCAWS console without having issues with the certificate and you are able to test your connection. 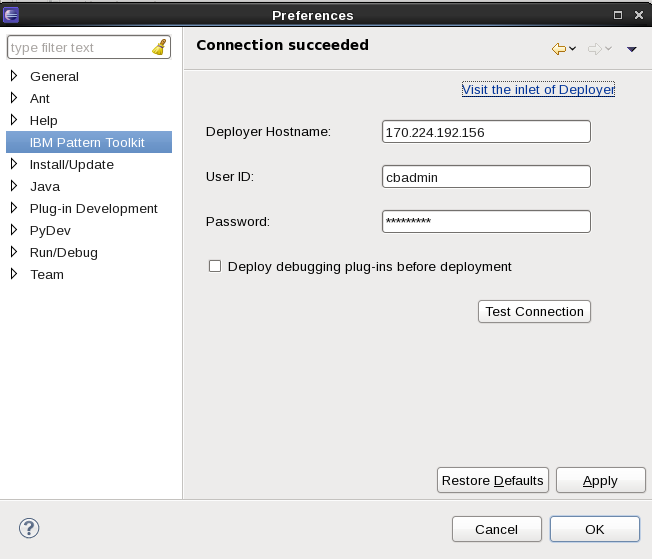 The check box “Deploy debugging plug-ins before deployment” will automatically deploy the “pdk-debug” and “pdk-unlock” plug-ins on your SCAWS environment. This provides you extra component to debug your pattern-type. For more information consult the info-center. Be aware that the “Resumable on script error” is not yet available on IWD 3.1.0.5. 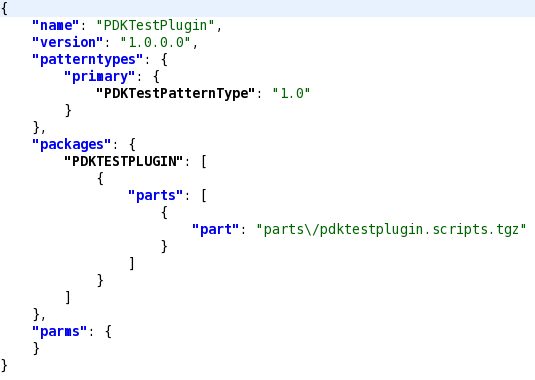 1) The PDK plugin will be able to enable/disable capabilities depending on the IWD version. 2) It allows you to push your pattern-type or plugin from Eclipse to your SCAWS. Nothing changed in this Wizard, but the editor for the patterntype.json has been improved such as the capability to create plugin project linked to this patterntype. This wizard has be improved, now you can directly link the plugin to a given patterntype by selecting existing patterntype in your workspace. If you don’t select an existing patterntype project, the wizard will create a new one with the provided name. Also, an interesting thing now, is that the package is completely configured in the config.josn file. All editors have been grouped into a single one, meaning if you double-click for example on the “metatdata.json” file, an editor will open with first an overview tab and then a pair of tabs. Each pair of tabs are composed by a tab file specific editor and an json editor for the same file. For the Overview tab, you can create parts, nodeparts and roles as you would do by using each specific wizard. You can also create components, links and policies and this directly from the overview. The overview also provide a view on each of these metadata information. You still have the wizards to create OSGi services, Parts, Nodeparts and Roles. There is no noticeable changes in the Parts, Nodeparts or Roles Wizard, except that the line “maestro.install_scripts(‘scripts’) is not anymore automatically inserted. The OSGi one has been improved. The generated *.vm in regards of the plugin configuration and not anymore like the HCenter sample, however some tuning are still needed. The role type and package have still to be updated with the correct values.